A recent paper by members of the Danish Stem Cell Centre in Copenhagen, the MRC Centre for Regenerative Medicine in Edinburgh, and Memorial Sloan Kettering Cancer Center in New York has used a synthetic version of the Oct4 protein to dissect the precise role of this protein in stem cells, and to more effectively generate induced pluripotent stem cells. Oct4 is a member of the “class V POU” transcription factors. POU stands for Pit-Oct-Unc, which are the founding members of this group of transcription factors. Transcription factors are proteins that bind to specific sequences of DNA and turn on gene expression. The POU family of transcription factors was originally defined on the basis of a common region of ~150–160 amino acids that was identified in the transcription factors Pit-1, Oct-1, and Oct-2, which were known from mammals, and the nematode factor Unc-86. This common POU protein domain is the DNA binding region that consists of two subdomains joined by a common linker. Embryonic development in mammals is controlled by regulatory genes, many of which regulate the expression of other genes. These regulators activate or repress patterns of gene expression that mediate the changes characteristic of development. Oct4, like other members of the POU family of transcription factors, activates the expression of their target genes by binding an eight-base sequence motif that usually has some similarity to this sequence: AGTCAAAT. During embryonic development, Oct4 is expressed initially in all the cells of the embryo, but eventually becomes restricted to the Inner Cell Mass (ICM) and Oct4 expression fades in the outer cells (known collectively as the trophectoderm). At maturity, Oct4 expression is confined exclusively to the developing germ cells. Disruption of Oct4 in mice produces embryos without a pluripotent ICM. This suggests that Oct4 is required for maintaining pluripotency. Given the importance of Oct4 in early development, it is no surprise that it plays an important role in embryonic stem cell maintenance. Oct4 also plays an essential role reprogramming adult cells from their mature state to the embryonic state. In the absence of Oct4, embryonic stem cells differentiate. Oct4 plays a powerful role in regulating stem cell genes. However, while large quantities of Oct4 are needed, too much of it can hamstring the properties of stem cells. Given these data, does Oct4 maintain pluripotency by activating the expression of particular genes or by repressing those genes necessary for differentiation? These scientists, whose work is published in the journal Cell Reports, made fusions of Oct4 with proteins that are known to activate gene expression or fusions with proteins known to repress gene expression. Then they accessed the ability of these fused versions of Oct4 to support pluripotency in embryonic stem cells or induce pluripotency in adult cells. The synthetic version of Oct4 fused to known activator of gene expression were much more efficient in turning on genes that instruct cells how to be stem cells. Cells also did not require as much of this synthetic Oct4; stem cells required less of the synthetic Oct4 to remain stem cells and adult cells required less to become reprogrammed as stem cells. Those synthetic versions of Oct4 that were fused to known transcriptional repressors caused cells to differentiate, and such synthetic versions of Oct4 could not replace endogenous Oct4 in stem cells. Further tests with the activating synthetic Oct4 showed that it could support stem cells under conditions that are usually not conducive to their growth. This provides a way to generate stem cells in the laboratory when growth conditions are less than optimal. Because the activator version of synthetic Oct4 could replace endogenous Oct4 and not the repressor version of synthetic Oct4, Oct4 must work primarily as an activator of gene expression rather than a repressor of gene expression. Exploitation of such technology could improve the efficiency of protocols to generate iPSCs in the laboratory and the clinic. Such cells could be used to produce individualized cells for developing individualized therapies for degenerative diseases such as type 1 diabetes and neuro-degenerative diseases. Human cloning can lead to nothing good. Right now it has stalled because of an acute shortage of human eggs (oocytes). The risk of the egg procurement procedure, and the work of people like my friend Jennifer Lahl and her film Eggsploitation, has dried up the supply of eggs. Thus cloning work has greatly slowed. TIlley’s work, however, could change that. Oh, sure, it will be sold as providing eggs for the infertile, which is a laudatory thing by the way. However, the use of huge numbers of eggs for human cloning purposes is a bridge too far. A cloned embryo is still a human embryo and is therefore still a human person. Cloning for manipulation and enhancement research is a grotesque abuse of human rights. You can read Smith’s article here. We have read it before, countless times, that women are born with a particular number of eggs and after they die during ovulation or are ovulated, the women is out of eggs and goes through menopause. She does not have the ability to make any more eggs. Well, another dogma falls by the wayside. As it turns out, egg-making stem cells exist in the woman’s ovaries. An article published in Nature Medicine by Jonathan Tilly and his colleagues who work in a laboratory at Massachusetts General Hospital in Boston, confirms earlier work by Tilly in 2004 that found ovarian stem cells exist in mouse ovaries (Joshua Johnson, et al., Germline stem cells and follicular renewal in the postnatal mammalian ovary. Nature 428, 145-150 (11 March 2004) | doi:10.1038/nature02316), and 2009 publication by a laboratory in Shanghai, China, that confirmed Tilly’s controversial publication (Kang Zou, et al., Production of offspring from a germline stem cell line derived from neonatal ovaries. Nature Cell Biology 11 (2009): 631 – 636). Despite the rigor of earlier experiments by Tilly’s group and Ji Wu’s, many ovarian experts remained quite skeptical that such a stem cell population existed in humans. This present publications, however, seems to seal the deal. According the Tilly, “This is unequivocal proof that not only was the mouse biology correct, but what we proposed eight years ago was also correct — that there was a human population of stem cells in young adult tissue.” says Tilly. By listening to their critics, Tilly and is group developed techniques to address the concerns to those skeptical of their findings. They a protocol by which they could isolate and identify mouse ovarian stem cells. This new methods use “fluorescence-activated cell sorting” or FACS. FACS requires the attachment of a fluorescent tag onto the surface of those cells you wish to isolate. Tilly and his group used antibodies linked to a fluorescent dye that could bind tightly to a surface protein called “Ddx4.” Ddx4 is found on the surfaces of ovarian stem cells, but is quickly lost once the stem cells differentiate into egg cells. Treating ovarian cells with the fluorescently-labeled antibodies essentially “painted” them a glowing color. Then the cells were given to a cell sorter than placed cells into one container or another, based on whether or not their surfaces glowed. The cell sorter also distinguishes between whole cells and dead or damaged ones that might fluoresce by accident. In this way, Tilly’s lab invested a protocol for isolating and identifying ovarian stem cells that was highly selective and sensitive. From the FACS experiment, Tilly’s group isolated human oogonial stem cells (OSCs). When cultured in the laboratory these OSCs spontaneously produced normal immature oocytes. How did the OSCs do this? To get an inside view of OSC differentiation, Tilly’s team labeled OSCs with green fluorescent protein in order to trace them. Then they injected the green-labeled OSCs into bits of cultured human ovarian tissue, and then transplanted the whole thing under the skin of mice. One to two weeks after transplantation, they found that the OSCs had formed green-glowing cells that greatly resembled ovaries and expressed two ovary-specific genes. Tilly sounded a cautious note: “There’s no confirmation that we have baby-making eggs yet, but every other indication is that these cells are the real deal — bona fide oocyte precursor cells.” To do this, Tilly must show that the OSC-derived oocytes can be fertilized and form an early embryo. Such work must be done with private funding, since federal funding cannot legally be used for any research that will result in the destruction of a human embryo, regardless of the source of the embryo. Another strategy might be to procure a license from the UK Human Fertilisation and Embryology Authority to do the work with collaborators in the United Kingdom. Tilly’s experiments have actually converted one scientist who was rather skeptical of his results. Evelyn Telfer, a reproductive biologist at the University of Edinburgh, UK, did not believe Tilly’s initial results. Now, however, she has become a believer. Telfer testified, “I’ve visited [Tilly’s] lab, seen these cells and how they behave. They’re convincing and impressive.” Telfer, has studied in vitro maturation of human eggs, and she wants to work with Tilly to try to grow the OSC-derived eggs to the point at which they are ready for fertilization. Telfer noted that even though OSCs can form egg-like cells in culture, there is presently no evidence that they can do so in the ovary or that they actually do form new eggs in the ovary. However, the ability to convert OSCs into eggs in vitro might make them usable for in vitro fertilization (IVF), and this achievement would change assisted reproduction forever. However, Tilly admonishes, “That’s a huge ‘if’.” However, it could means that women who under cancer treatments and experience early menopause could have OSCs removed before treatment and for later fertility use. In fact, according to Tilly, follow-up experiments have shown that OSCs actually exist in the ovaries of women well into their 40s. Even giving women another five years would cover most women affected by IVF. When you sit down to study something new and try to commit it to memory, you find yourself retaining some things, but forgetting others. However, learning new material does not tend to prevent you from recalling older material. How do neurons, the cells that are responsible for neural impulse in the nervous system, do this? How do they form new memories without compromising old ones? To answer this question, neuroscientists at the RIKEN-MIT Center for Neural Circuit Genetics examined neural stem cells to dissection the function of a specific portion of the brain known to be involved in forming new memories. Their results are remarkable, and will be published in the March 30th issue of the journal, Cell. This study connects the cellular basis of memory formation with the birth of new neurons. This discovery could offer new strategies for drug makers to make new classed of drugs to treat memory disorders. 1. Hippocampus – This is required for long-term memories and maintains cognitive maps for navigation. 2. Fornix – transmits neural signals from the hippocampus to the mammillary bodies and septal nuclei. 3. Mammillary body – these structures are essential for the formation of memories. 4. Septal nuclei provide essential interconnections between various parts of the limbic system. 5. Amygdala – signals the cerebral cortex when complex stimuli are received, such as fear, rewards, or sexual mating behaviors. 6. 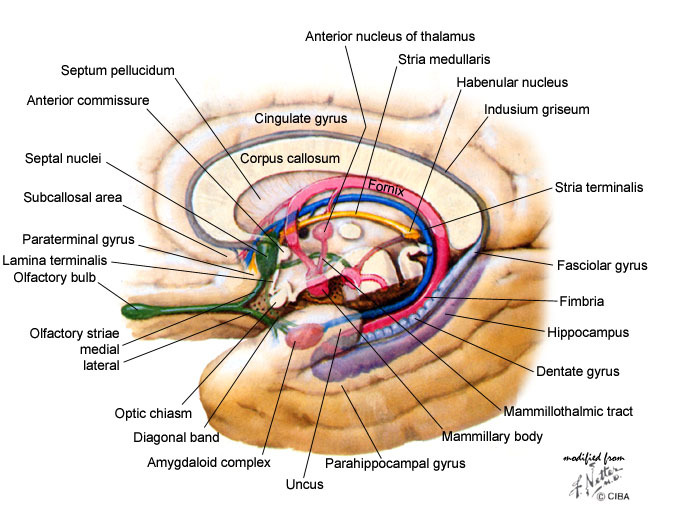 Parahippocampal gyrus – this plays an important role in spatial memory. 7. Cingulate gyrus – regulates bodily functions like the heart rate, blood pressure and the ability of pay attention to particular things. 8. Dentate gyrus – contributes to new memories. The hippocampus, and in particular the dentate gyrus is the site of stem cell populations in the brain (see Ming GL and Song H, Neuron 2011 70(4):687-702). This stem cell population has been thought to contribute to the production of new memories. However, one remarkable new find is that decreased neurogenesis in the dentate gyrus leads to depression. To read more about this, see this site here. In the present study from the RIKEN-MIT group, the ability of the dentate gyrus to form new memories depends on whether or not the neural stem cells in the dentate gyrus are old or young. These findings also suggest that imbalances between young and old neurons in the dentate gyrus and possibly other regions of the brain as well could potentially disrupt the formation of memories during post-traumatic stress disorder (PTSD) and aging. This could also explain the link between depression and poor memory formation in patients with depression. In this study, researchers tested two types of memory processed in mice. The first is called “pattern separation,” which the means by which the brain distinguishes differences between different events that are similar, but different. For example, remembering two pepperoni pizzas that have different tastes would be one such example, since the two pizzas might look similar, but they have very different gustatory outcomes. The second, “pattern completion” remembers detailed content with few clues. For example, when you memorize lines from a play, you can start anywhere in the play if someone only gives you the first few words on one sentence. Alternatively, if we stick with our pizza example, remembering who was with you and what they were wearing when you had that great pizza would be an example of using pattern completion. The formation of new memories on the basis of pattern separation utilizes differences between experiences. Pattern completion, on the other hand, recalls memories by detecting similarities. In patients with brain injury or specific types of trauma, cannot remember people they encounter every day. Others with PTSD cannot forget horrific events. According the Dr. Tonegawa, “Impaired pattern separation due to the loss of young neurons may shift the balance in favor of pattern completion, which may underlie recurrent traumatic memory recall observed in PTSD patients. Pattern separation was assessed in mice that had learned to different, but similar chambers. One of these chambers was safe, but the other was dangerous, since upon entering it the mice received an electric shock in their feet. Since these mice had discriminated between to similar but different chambers, the group tested their pattern completion capabilities. To do this, they gave the mice limited cues to scurry through a maze that they had previously learned. Normal mice were compared with mice that had deficits or either old or new neurons in their dentate gyruses. Interestingly, mice exhibited defects in either pattern completion or separation depending on whether the old or the new neurons were missing. This remarkable study will almost certainly be the beginning of an entirely new way of looking at depression. Collaborators in this work included researchers from the laboratories of Michael S. Fanselow at the University of California at Los Angeles; and Chris J. McBain at the National Institute of Child Health and Human Development. A whole gaggle of stem cells treatments for heart attack patients have been completed. Some patients are definitely helped, but others are not. Some clinical trials have shown a definitively positive effect from stem cell infusions in combination with standard care. Other trials, however, have failed to show any positive benefits to combining stem cell infusions with standard care. What do these clinical trials as a whole tell us? This question is the realm of “meta-analyses.” While several clinical trials that have given stem cell treatments on heart attack patients have been subjected to meta-analyses, more stem cell trials have been completed, and further analyses are necessary. Meta-analyses take data from separately published studies that were conducted at different times and places and combine these data into a giant database that is subjected to rigorous statistical analysis. One organization that excels at meta-analyses, and has a solid reputation in the field is the Cochrane Library. The Cochrane Library has just completed a systematic meta-analysis of the data generated in 33 different clinical trials that used adult stem cells to treat the hearts of heart attack patients. The Cochrane Library’s analysis revealed that heart function definitely improves after stem cell treatments. However, these same analyses showed that the data are limited by the predominance of small trials and larger clinical trials are necessary to more rigorously demonstrate if the benefit of stem cell treatments in the heart actually means that the treated patients will benefit from a longer and healthier life. Heart attacks are caused by blocked coronary arteries that prevent life-giving oxygen from flowing to heart muscle. This lack of oxygen causes the demanding heart muscle cells to die, and this cell death damages the heart and leads to the production of a scar that does not contract or conduct electrical impulses. Clinical trials have used adult stem cells from the patient’s own bone marrow to repair and reduce this damage. Although, unfortunately, this treatment regime is only available in facilities that have close links to medical research facilities. The Cochrane Library authors (David M Clifford and colleagues), cobbled together data from as many clinical trials that used bone marrow stem cells to treat heart attack patients as they could find. In 2008, Cochrane reviewed 13 clinical trials to address this very question. However, since that time, 20 more clinical trials have been completed, and this year, 33 clinical trials that treated 1,765 patients were analyzed. Since the earlier trials continued patient follow-up, there are new data points from many older clinical trials that were also included. These data provide a more precise indication of the effects of stem cell therapy several years after completion of stem cell treatment. In the analyzed trials, all 1,765 patients had already undergone angioplasty, which is a conventional treatment for heart attack patients. Angioplasty uses an inflatable balloon that is fed into the coronary artery by means of a fine catheter. This catheter is inserted into a large vein and guided by imaging methods to the blocked coronary arteries. Once in place, the balloon is slowly inflated to push the obstructing material to the sides of the artery. This opens up the blocked artery and allows the flow of blood to the heart muscle. To keep the blood vessel open, sometimes a stent is inserted into the blocked vessel. If angioplasty is combined with bone marrow stem cell treatments, the Cochrane reviews finds that such treatments can produce moderate long-term improvement in heart function that is sustained for up to five years. Unfortunately, there was not enough data to reach firm conclusions about increases in survival rates. Will such treatments become part of the treatment for a heart attack? At this point it is difficult to say with any certainty. It is simply too early to establish guidelines for standard practice, since several labs have used differing transplantation and cell isolation and storage methods. According to the Cochrane Review, further work is required to properly standardize the procedure. For instance, there is little agreement on the dosage of cells for the heart, even though several studies have shown a dose-specific effect. Secondly, a standardized protocol for when after the heart attack treatment should be given, and what methods most accurately measure heart function must be constructed before such a procedure is universally offered to patients. Martin-Rendon noted, “The studies were hard to compare because they used so many different methods. Larger trials with standardized treatment procedures would help us to know whether this treatment is really effective. Biomedical researchers from the University of California, San Francisco (UCSF) have published a stem cell experiment in mice that might provide another way to fix damaged heart muscle in heart attack patients. If these results pan out, they could potentially could increase heart function, minimize scar size, promote the growth of new blood vessels around the heart, and doo all this while avoiding the risk to tissue rejection. Sounds too good to be true? It was published in PLoS ONE. You can read about it here. To summarize the experiments, researchers isolated a new heart-specific stem cell from the heart tissue of middle-aged mice. When cultured in a laboratory dish, the cells had the ability to differentiate into heart muscle cells that beat in the culture dish. However, these same cells could also become blood vessels, or smooth muscle, which surrounds blood vessels and regulates the diameter of the vessels. All of these tissues are essential for the heart to work and properly function. After showing that these cells could be grown in the laboratory in converted into heart-specific cell types, this research group examined the ability of these cells to do the same thing inside a living organism. After expanding the cells in culture, they transplanted them into the hearts of sibling mice that had the same genetic lineage as the mice from which the heart stem cells had been isolated in the first place. This prevented the possibility of the immune system of the recipient mice from attacking and rejecting the implanted cells. The implanted stem cells made blood vessels and also formed smooth muscle. The increased blood flow improved heart function. Even more exciting, these heart specific stem cells are found in all four chambers of the heart. The “cardiosphere-derived cells” (CDCs) that have been used in other clinical trials are only found in the upper chambers of the heart (atria), and express slightly different cell surface proteins. When grown in culture, these cells grow into spheres of cells that are known as “cardiospheres.” These new heart-specific stem cells are more widely located in the heart, which means that it is possible to isolate them from patients’ hearts by doing ventricular or atrial biopsies. Biopsies of the right ventricle are among the safest procedures for procuring heart cells from live patients. This procedure is relatively easy to perform and does not adversely affect the patient. Yeghiazarians hopes that those patients who have suffered severe heart failure after a heart attack or have enlargement of the heart (cardiomyopathy) could still be treated with their own heart-specific stem cells to improve their overall health and heart function. Because these cells would come from the patients, there would be no concern of cell rejection after therapy. These heart-specific stem cells are also known as Sca-1+ stem cells. Sca-1 is a small cell surface protein that is involved in cell signaling. These heart-specific Sca-1+ cells also express a transcription factor called Islet (Isl-1). These cells are known to play an important role in heart development. Most of the previous research on heart stem cells has examined different subset of cells known as “c-kit” cells. Sca-1+ cells, like the c-kit cells, are located within a larger clump of cells called cardiospheres. To isolate the Sca-1+ cells, Yeghiazarians’ group devised ways to separate the Sca-1-expressing cells that were also expressing high levels of Isl-1. Sca-1 is rather easy to use for isolation, since it is a cell surface protein, but Isa-1 is a nuclear protein and is less useful for isolation purposes. Yeghiazarians proposed that the co-expression of these two molecules that are also made during heart development suggests a strategy for heart therapy: “Heart disease, including heart attack and heart failure, is the number one killer in advanced countries. It would be a huge advance if we could decrease repeat hospitalizations, improve the quality of life and increase survival.” By giving the heart cells that are extremely similar to those cells that help construct it during development; those same cells could reconstruct the heart when it starts to fail. More studies are on the board for the future, and these animal studies might lead to future clinical trials. Umbilical cord and umbilical cord blood contains a wealth of stem cells for multiple uses. Cord blood contains a blood cell-making stem cell that can be used to constitute bone marrow (see Gluckman E., Blood Rev. 2011;25(6):255-9). It also contains two mesenchymal stem cell populations: Wharton’s Jelly Mesenchymal Stem Cells (WJ-MSCs) and Human Umbilical Cord Perivascular Cells (HUCPVCs). Both of these cell populations have remarkable potential or regenerative medicine (Carvalho MM., et al. Curr Stem Cell Res Ther. 2011;6(3):221-8). Other umbilical cord stem cells include unrestricted somatic stem cells (USSCs; Arien-Zakay H, Lazarovici P, Nagler A., Best Pract Res Clin Haematol. 2010;23(2):291-303), embryonic-like stem cells, blood vessel-based endothelial stem cells, and a stem cell that comes from those cells that cover tissues (epithelial stem cells; see Harris DT., Stem Cell Rev. 2008;4(4):269-74, & Harris DT., Br J Haematol. 2009;147(2):177-84). The usefulness of cord blood has been recognized by the medical community for some time, and there are now umbilical cord blood registries that bank cord blood for medical use and for research. One of these registries, the Cord Blood Registry (CBR) works with various research laboratories to help discover ways to use a child’s own cord blood stem cells to treat conditions like pediatric brain injury or even acquired hearing loss. Because different laboratories use different protocols or equipment to process umbilical cord blood, the experimental results derived from experiments or clinical trials that use cord blood might vary widely. Therefore, to ensure consistency in the storage and processing of cord blood stems, three separate clinical trials have used cord blood that provided by the CBR in their FDA-authorized protocols. These research institutions include the University of Texas Health Science Center at Houston (UTHealth) in partnership with Children’s Memorial Hermann Hospital, and Georgia Health Sciences University, which is the home of the Medical College of Georgia (MCG). CBR is the only family stem cell bank that pairs researchers conducting clinical trials with prospective patients for their studies. One of the clinical trials examined the ability of cord blood stem cells to treat hearing loss. Hearing loss can result from problems with the middle ear, which conducts sound to the cochlea (conductive hearing loss) or from problems with the inner ear, in which the cochlea itself is damaged or defective (sensorineural hearing). Sensorineural hearing loss affects approximately 6 per 1,000 children by 18 years of age, with 9% of the cases resulting from various external causes (e.g., viral infection and head injury). Samer Fakhri, M.D., surgeon at Memorial Hermann-Texas Medical Center and associate professor and program director in the Department of Otorhinolaryngology – Head & Neck Surgery at UTHealth, heads the research team investigating the use of cord blood to treat sensorineural hearing loss. His collaborator is James Baumgartner, M.D. The Fakhri-Baumgartner study is a Phase I safety study that uses cord blood-based stem cells to treat children who suffer from acquired hearing loss. The inspiration for this trial comes from animal studies that used cord blood to repair damaged organs in the inner ear. The paper (Revoltella RP., et al., Cell Transplant. 2008;17(6):665-78), used mice that had been made deaf from treatment with aminoglycoside antibiotics, which cause irreversible deafness at particular dosages, and intensely loud noises, which also cause deafness. Intravenous administration of hematopoietic stem cells from umbilical cord blood stimulated some structural recovery in the inner ear that was due to umbilical cord stem cells that had survived and become part of the inner ear tissues. Another clinical trial is examining the ability of cord blood to treat brain trauma. Children who experience brain injury heal better than adults who experienced the same injury. Having said that brain trauma is one of the leading causes of childhood death. Charles S. Cox, M.D., distinguished professor of pediatric surgery and pediatrics at UTHealth, initiated a clinical study that will enroll 10 children ages 18 months to 17 years old, all of whom have umbilical cord blood banked with CBR, and have suffered some type of traumatic brain injury. These children will enroll in the study within 6-18 months of suffering brain injury. This trial grows from a growing corpus of studies that have demonstrated the efficacy of umbilical blood stem cells to treat neurological conditions. Read more about the trial here. James Carroll professor and chief of pediatric neurology at the GHSU in Augusta, Georgia, launched the first FDA-regulated clinical trial to test the ability of cord blood stem cell infusions to improve the condition of children with cerebral palsy. This clinical trial will include 40 children whose parents have banked their umbilical cord blood at CBR and meet all the criteria for inclusion in the trial. Brain injuries or lack of oxygen either before birth, during birth, or during the first years of life can damage specific motor pathways in the brain and lead to an inability properly move, learn, hear, see, or think normally. According to the Centers for Disease Control, 2-3 / 1,000 children are affected by cerebral palsy.